Jo devoted herself to Beth day and night, not a hard task, for Beth was very patient, and bore her pain uncomplainingly as long as she could control herself. But there came a time when during the fever fits she began to talk in a hoarse, broken voice, to play on the coverlet as if on her beloved little piano, and try to sing with a throat so swollen that there was no music left, a time when she did not know the familiar faces around her, but addressed them by wrong names, and called imploringly for her mother. Then Jo grew frightened, Meg begged to be allowed to write the truth, and even Hannah said she `would think of it, though there was no danger yet'. A letter from Washington added to their trouble, for Mr. March had had a relapse, and could not think of coming home for a long while. How dark the days seemed now, how sad and lonely the house, and how heavy were the hearts of the sisters as they worked and waited, while the shadow of death hovered over the once happy home. Then it was that Margaret, sitting alone with tears dropping often on her work, felt how rich she had been in things more precious than any luxuries money could buy--in love, protection, peace, and health, the real blessings of life. Then it was that Jo, living in the darkened room, with that suffering little sister always before her eyes and that pathetic voice sounding in her ears, learned to see the beauty and to sweetness of Beth's nature, to feel how deep and tender a place she filled in all hearts, and to acknowledge the worth of Beth's unselfish ambition to live for others, and make home happy by that exercise of those simple virtues which all may possess, and which all should love and value more than talent, wealth, or beauty. And Amy, in her exile, longed eagerly to be at home, that she might work for Beth, feeling now that no service would be hard or irksome, and remembering, with regretful grief, how many neglected tasks those willing hands had done for her. Laurie haunted the house like a restless ghost, and Mr. Laurence locke the grand piano, because he could not bear to be reminded of the young neighbor who used to make the twilight pleasant for him. Everyone missed Beth. The milkman, baker, grocer, and butcher inquired how she did, poor Mrs. Hummel came to beg pardon for her thoughtlessness and to get a shroud for Minna, the neighbors sent all sorts of comforts and good wishes, and even those who knew her best were surprised to find how many friends shy little Beth had made. Meanwhile she lay on her bed with old Joanna at her side, for even in her wanderings she did not forget her forlorn protege. She longed for her cats, but would not have them brought, lest they should get sick, and in her quiet hours she was full of anxiety about Jo. She sent loving messages to Amy, bade them tell her mother that she would write soon, and often begged for pencil and paper to try to say a word, that Father might not think she had neglected him. But soon even these intervals of consciousness ended, and she lay hour after hour, tossing to and fro, with incoherent words on her lips, or sank into a heavy sleep which brought her no refreshment. Dr. Bangs came twice a day, Hannah sat up at night, Meg kept a telegram in her desk all ready to send off at any minute, and Jo never stirred from Beth's side. The first of December was a wintry day indeed to them, for a bitter wind blew, snow fell fast, and the year seemed getting ready for its death. 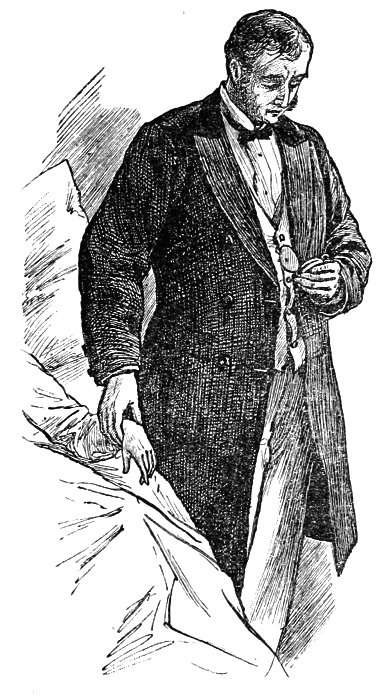 When Dr. Bangs came that morning, he looked long at Beth, held the hot hand in both his own for a minute, and laid it gently down, saying, in a low voice to Hannah, "If Mrs. March can leave her husband she'd better be sent for." Hannah nodded without speaking, for her lips twitched nervously, Meg dropped down into a chair as the strength seemed to go out of her limbs at the sound of those words, and Jo, standing with a pale face for a minute, ran to the parlor, snatched up the telegram, and throwing on her things, rushed out into the storm. She was soon back, and while noiselessly taking off her cloak, Laurie came in with a letter, saying that Mr. March was mending again. Jo read it thankfully, but the heavy weight did not seem lifted off her heart, and her face was so full of misery that Laurie asked quickly, "What is it? Is Beth worse?" "I've sent for Mother," said Jo, tugging at her rubber boots with a tragic expression. "Good for you, Jo! Did you do it on your own responsibility?" asked Laurie, as he seated her in the hall chair and took off the rebellious boots, seeing how her hands shook. "No. The doctor told us to." "Oh, Jo, it's not so bad as that?" cried Laurie, with a startled face. "Yes, it is. She doesn't know us, she doesn't even talk about the flocks of green doves, as she calls the vine leaves on the wall. She doesn't look like my Beth, and there's nobody to help us bear it. Mother and father both gone, and God seems so far away I can't find Him." As the tears streamed fast down poor Jo's cheeks, she stretched out her hand in a helpless sort of way, as if groping in the dark, and Laurie took it in his, whispering as well as he could with a lump in his throat, "I'm here. Hold on tome, Jo, dear!" She could not speak, but she did `hold on', and the warm grasp of the friendly human hand comforted her sore heart, and seemed to lead her nearer to the Divine arm which alone could uphold her in her trouble. Laurie longed to say something tender and comfortable, but no fitting words came to him, so he stood silent, gently stroking her bent head as her mother used to do. It was the best thing he could have done, far more soothing than the most eloquent words, for Jo felt the unspoken sympathy, and in the silence learned the sweet solace which affection administers to sorrow. Soon she dried the tears which had relieved her, and looked up with a grateful face. "Thank you, Teddy, I'm better now. I don't feel so forlorn, and will try to bear it if it comes." "Keep hoping for the best, that will help you, Jo. Soon your mother will be here, and then everything will be all right." "I'm so glad Father is better. Now she won't feel so bad about leaving him. Oh, me! It does seem as if all the troubles came in a heap, and I got the heaviest part on my shoulders," sighed Jo, spreading her wet handkerchief over her knees to dry. "Doesn't Meg pull fair?" asked Laurie, looking indignant. "Oh, yes, she tries to, but she can't love Bethy as I do, and she won't miss her as I shall. Beth is my conscience, and I can't give her up. I can't! I can't!" Down went Jo's face into the wet handkerchief, and she cried despairingly, for she had kept up bravely till now and never shed a tear. Laurie drew his hand across his eyes, but could not speak till he had subdued the choky feeling in his throat and steadied his lips. It might be unmanly, but he couldn't help it, and I am glad of it. Presently, as Jo's sobs quieted, he said hopefully, "I don't think she will die. She's so good, and we all love her so much, I don't believe God will take her away yet." "The good and dear people always do die," groaned Jo, but she stopped crying, for her friend's words cheered her up in spite of her own doubts and fears. "Poor girl, you're worn out. It isn't like you to be forlorn. Stop a bit. I'll hearten you up in a jiffy." Laurie went off two stairs at a time, and Jo laid her wearied head down on Beth's little brown hood, which no one had thought of moving from the table where she left it. It must have possessed some magic, for the submissive spirit of its gentle owner seemed to enter into Jo, and when Laurie came running down with a glass of wine, she took it with a smile, and said bravely, "I drink-- Health to my Beth! You are a good doctor, Teddy, and such a comfortable friend. How can I ever pay you?" she added, as the wine refreshed her body, as the kind words had done her troubled mind. "I'll send my bill, by-and-by, and tonight I'll give you some- thing that will warm the cockles of your heart better than quarts of wine," said Laurie, beaming at her with a face of suppressed satisfaction at something. "What is it?" cried Jo, forgetting her woes for a minute in her wonder. "I telegraphed to your mother yesterday, and Brooke answered she'd come at once, and she'll be here tonight, and everything will be all right. Aren't you glad I did it?" Laurie spoke very fast, and turned red and excited all in a minute, for he had kept his plot a secret, for fear of disappointing the girls or harming Beth. Jo grew quite white, flew out of her chair, and the moment he stopped speaking she electrified him by throwing her arms round his neck, and crying out, with a joyful cry, "Oh, Laurie! Oh, Mother! I am so glad!" She did not weep again, but laughed hysterically, and trembled and clung to her friend as if she was a little bewildered by the sudden news. Laurie, though decidedly amazed, behaved with great presence of mind. He patted her back soothingly, and finding that she was recovering, followed it up by a bashful kiss or two, which brought Jo round at once. Holding on to the banisters, she put him gently away, saying breathlessly, "Oh, don't! I didn't mean to, it was dreadful of me, but you were such a dear to go and do it in spite of Hannah that I couldn't help flying at you. Tell me all about it, and don't give me wine again, it makes me act so." "I don't mind," laughed Laurie, as he settled his tie. "Why, you see I got fidgety, and so did Grandpa. We thought Hannah was overdoing the authority business, and your mother ought to know. She'd never forgive us if Beth... Well, if anything happened, you know. So I got grandpa to say it was high time we did something, and off I pelted to the office yesterday, for the doctor looked sober, and Hannah most took my head off when I proposed a telegram. I never can bear to be `lorded over', so that settled my mind, and I did it. Your mother will come, I know, and the late train is in at two A.M. I shall go for her, and you've only got to bottle up your rapture, and keep Beth quiet till that blessed lady gets here." "Laurie, you're an angel! How shall I ever thank you?" "Fly at me again. I rather liked it," said Laurie, looking mischievous, a thing he had not done for a fortnight. "No, thank you. I'll do it by proxy, when your grandpa comes. Don't tease, but go home and rest, for you'll be up half the night. Bless you, Teddy, bless you!" Jo had backed into a corner, and as she finished her speech, she vanished precipitately into the kitchen, where she sat down upon a dresser and told the assembled cats that she was "happy, oh, so happy!" while Laurie departed, feeling that he had made a rather neat thing of it. "That's the interferingest chap I ever see, but I forgive him and do hope Mrs. March is coming right away," said Hannah, with an air of relief, when Jo told the good news. Meg had a quiet rapture, and then brooded over the letter, while Jo set the sickroom in order, and Hannah `knocked up a couple of pies in case of company unexpected". A breath of fresh air seemed to blow through the house, and something better than sunshine brightened the quiet rooms. Everything appeared to feel the hopeful change. Beth's bird began to chirp again, and a half-blown rose was discovered on Amy's bush in the window. The fires seemed to burn with unusual cheeriness, and every time the girls met, their pale faces broke into smiles as they hugged one another, whispering encouragingly, "Mother's coming, dear! Mother's coming!" Every one rejoiced but Beth. She lay in that heavy stupor, alike unconscious of hope and joy, doubt and danger. It was a piteous sight, the once rosy face so changed and vacant, the once busy hands so weak and wasted, the once smiling lips quite dumb, and the once pretty, well-kept hair scattered rough and tangled on the pillow. All day she say so, only rousing now and then to mutter, "Water!" with lips so parched they could hardly shape the word. All day Jo and Meg hovered over her, watching, waiting, hoping, and trusting in God and Mother, and all day the snow fell, the bitter wind raged, and the hours dragged slowly by. But night came at last, and every time the clock struck, the sisters, still sitting on either side of the bed, looked at each other with brightening eyes, for each hour brought help nearer. The doctor had been in to say that some change, for better or worse, would probably take place about midnight, at which time he would return. Hannah, quite worn out, lay down on the sofa at the bed's foot and fell fast asleep, Mr. Laurence marched to and fro in the parlor, feeling that he would rather face a rebel battery than Mrs. March's countenance as she entered. Laurie lay on the rug, pretending to rest, but staring into the fire with the thoughtful look which made his black eyes beautifully soft and clear. The girls never forgot that night, for no sleep came to them as they kept their watch, with that dreadful sense of powerlessness which comes to us in hours like those. "If God spares Beth, I never will complain again," whispered Meg earnestly. "If god spares Beth, I'll try to love and serve Him all my life," answered Jo, with equal fervor. "I wish I had no heart, it aches so," sighed Meg, after a pause. "If life is often as hard as this, I don't see how we ever shall get through it," added her sister despondently. Here the clock struck twelve, and both forgot themselves in watching Beth, for they fancied a change passed over her wan face. The house was still as death, and nothing but the wailing of the wind broke the deep hush. Weary Hannah slept on, and no one but the sisters saw the pale shadow which seemed to fall upon the little bed. An hour went by, and nothing happened except Laurie's quiet departure for the station. Another hour, still no one came, and anxious fears of delay in the storm, or accidents by the way, or, worst of all, a great grief at Washington, haunted the girls. It was past two, when Jo, who stood at the window thinking how dreary the world looked in its winding sheet of snow, heard a movement by the bed, and turning quickly, saw Meg kneeling before their mother's easy chair with her face hidden. A dreadful fear passed coldly over Jo, as she thought, "Beth is dead, and Meg is afraid to tell me." She was back at her post in an instant, and to her excited eyes a great change seemed to have taken place. The fever flush and the look of pain were gone, and the beloved little face looked so pale and peaceful in its utter repose that Jo felt no desire to weep or to lament. Leaning low over this dearest of her sisters, she kissed the damp forehead with her heart on her lips, and softly whispered, "Goodby, my Beth. Goodby!" As if awaked by the stir, Hannah started out of her sleep, hurried to the bed, looked at Beth, felt her hands, listened at her lips, and then, throwing her apron over her head, sat down to rock to and fro, exclaiming, under her breath, "The fever's turned, she's sleepin' nat'ral, her skin's damp, and she breathes easy. Praise be given! Oh, my goodness me!" Before the girls could believe the happy truth, the doctor came to confirm it. He was a homely man, but they thought his face quite heavenly when he smiled and said, with a fatherly look at them, "Yes, my dears, I think the little girl will pull through this time. Keep the house quiet, let her sleep, and when she wakes, give her..."
What they were to give, neither heard, for both crept into the dark hall, and, sitting on the stairs, held each other close, rejoicing with hearts too full for words. When they went back to be kissed and cuddled by faithful Hannah, they found Beth lying, as she used to do, with her cheek pillowed on her hand, the dreadful pallor gone, and breathing quietly, as if just fallen asleep. "If Mother would only come now!" said Jo, as the winter night began to wane. "See," said Meg, coming up with a white, half-opened rose, "I thought this would hardly be ready to lay in Beth's hand tomorrow if she--went away from us. But it has blossomed in the night, and now I mean to put it in my vase here, so that when the darling wakes, the first thing she sees will be the little rose, and Mother's face." Never had the sun risen so beautifully, and never had the world seemed so lovely as it did to the heavy eyes of Meg and Jo, as they looked out in the early morning, when their long, sad vigil was done. "It looks like a fairy world," said Meg, smiling to herself, as she stood behind the curtain, watching the dazzling sight. "Hark!" cried Jo, starting to her feet. Yes, there was a sound of bells at the door below, a cry from Hannah, and then Laurie's voice saying in a joyful whisper, "Girls, she's come! She's come!"